The old gentleman in this photograph is Charles W. Newell who was born in 1811 and lived in Amherst until the early 1880s, when this photo was taken. 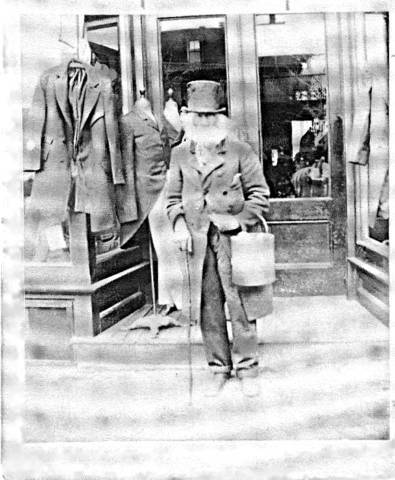 Newell is seen standing in front of Charles H. Sanderson's store on the east side of North Pleasant Street. Sanderson was described as a "Cash dealer in ready-made Clothing, Gentlemen's Furnishing Goods, Hats, Caps, Umbrellas, etc. Agent for Northampton Steam Laundry." The shop was in Dickinson Block, now Thompson's Block, a site which has a long history as a clothing store. Today it is the Lodestone Clothing Shop, next door to the Northampton Cooperative Bank. Charles Sanderson was born in New York in 1845, he sold his shop in Amherst to Floyd Thompson in 1918, and he died in 1932. The shop front was renovated in 1952, and Thompson's became Lodestone in 1980. Little is known of Charles Newell, however. He was a farmer in East Amherst, then later in Factory Hollow in North Amherst. His chief fame stems from an unusual calf he owned in 1849 while living in East Amherst. At the age of five weeks and two days the calf weighted 225 pounds. Newell entered the beast in the Amherst Cattle Show but through some misunderstanding no notice was taken of it. At two and one half months old it weighed 320 pounds and was gaining at a rate of nearly three pounds a day. Newell never married, and by 1886 he had moved to Pelham. While the Federal Census taker in 1880 described most people's occupations as "blacksmith" or "carriage painter," under Charles W. Newell's occupation he stated "Rich old bachelor, no occupation."